Sublime kung fu comedy from the Yuen clan, devised as a sequel to Drunken Master with much of the original cast returning in similar roles. Apart from one glaring absence, Jackie Chan; although young Sunny Yuen slips nicely into the same naive persona, even if he lacks a leading man’s charisma. He plays Foggy, a part-time pot-wash bumpkin and the adoptive son of drunken vagabond Sam the Seed (played by real-life Yuen clan patriarch Simon Yuen). Sam only discovers he has an adopted son following a chance visit to his long-suffering wife, who devises a plan to help with some father-son bonding time by getting the disgruntled beggar to teach the young boy some drunken boxing. Woo-ping expands on the vindictive yet soft centred Sam the Seed from his earlier portrayal in Drunken Master. Here, he is far from cuddly – he is stubborn and reluctant to teach the boy anything particularly useful in a callous attempt to undermine his significance. It is only upon a chance meeting with the Sick God (Yen Shi-kwan) – master of the “Sick Fist” – that Foggy finds his father figure, learning kung fu and developing into a supreme fighter. Not unsurprisingly, Hwang Jang-lee rips up the screen as the villain of the piece, playing Rubber Legs – a northern drunken boxing expert on a quest to confront Sam the Seed and end his days. Rubber Legs has devised a new technique of combining the Drunken Fist with the Praying Mantis style, and in combination with his exuberant kicking technique, he puts up quite a challenge. The scene in which Rubber Legs and Sam the Seed meet over bottles of rice wine is a classic encounter of mind games, posturing and kung fu tricks – a really fantastic sequence. But the film is full of great moments, like Foggy’s ascension to kung fu greatness via some unorthodox training scenes, and a climactic duel in which Foggy must protect his foster parent despite the cruelty he has shown towards him. On one level, you could read this as Woo-ping’s most personal film. 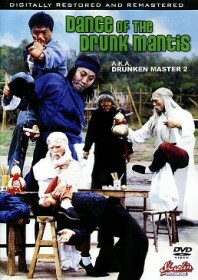 But on a less pretentious level, it is simply one of his most enjoyable kung fu movies.